TWENTY-ONE Oaky North workers have been slammed for their "appalling" behaviour at the picket line by a Fair Work Commissioner. However, mine owner Glencore has been ordered to stop disciplinary action against those workers and spying on them in their private lives. The decisions came after a fiery hearing at which the CFMEU and Glencore each gave evidence of power games used in a bid to win the long-standing feud over a new enterprise agreement. Commissioner Ingrid Asbury found a series of "allegation letters" that were sent to 21 workers --- whose behaviour on the picket was reportedly filmed and photographed by a security firm hired by Glencore in July --- appeared to be an intimidating message from Glencore. Commissioner Asbury wrote in her decision that the drafting of the letters had "coincided with results of the ballot for approval of the company's proposed agreement and the overwhelming rejection of that proposal by employees". She believed Glencore had been more concerned about security staff gathering video and photographic evidence of the workers' poor conduct than addressing the issue, which she said was shown by how long it took the company to send the "allegation letters". Further, Commissioner Asbury ordered Glencore to stop its surveillance of protesting workers when they were not at the picket line. Glencore was also ordered to lift the ban on workers wearing union shirts. And importantly for the 21 workers, they won't be held accountable by the miner for their actions at the picket line and on social media. They were among 190 workers who began protected industrial action in May, escalating to rolling stoppages from June. Glencore locked the workers out of the mine on July 20 and they have been at the picket line on the outskirts of Tieri since. The Commission heard that the workers allegedly shouted "grub", "f---ing grub" and "maggot" at other workers leaving the mine, including contractors Glencore employed to do their jobs while they were locked out. It included offensive hand gestures... and direct comments such as "why don't you hang yourself" to individuals crossing the picket line. Five workers were being threatened with disciplinary action for posts on union Facebook pages, including someone writing "lynching in order" in relation to another worker, and comments made on the Daily Mercury's Facebook page. Despite the damning findings against Glencore, Commissioner Asbury still condemned the action of those workers at the picket line as "appalling". She also found the CFMEU's attempts to keep the behaviour at the picket line under control didn't work even though officials had laid down ground rules. "It appears from the video footage of the conduct of CFMEU officials on the picket line that the adage "Do as I say, not as I do" is apt." 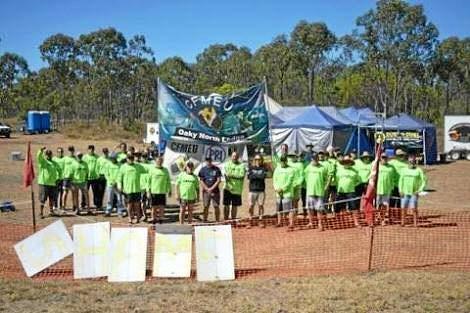 Oaky North Coal Mine workers are expected to vote on a new proposed enterprise agreement over the coming three days.